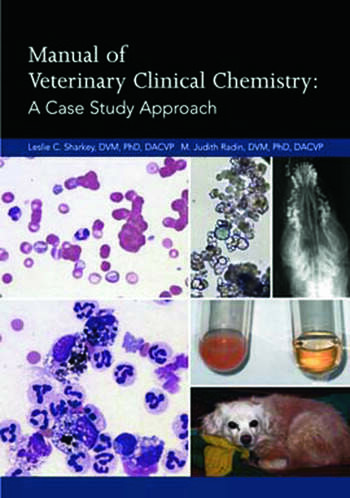 This case study based workbook provides veterinary students and non-specialist with a guide to effective use and interpretation of clinical chemistry laboratory methods in domestic animals. The 100+ case studies involve real patients and findings in dogs, cats, horses, lamas, alpacas, pot belled pigs and ferrets. These consist of patient history, physical examination findings, and clinicopthologic data such as CBC, urinalysis, cytology or fluid analysis. A summary is given for each patient that includes a description of follow up tests and response to treatment. Multiple cases of common diseases illustrate the variety of clinciopathologic findings with the same diagnosis depending on individual patient factors. Diagnostic dilemmas in which different diseases may present with similar clinical signs and laboratory data are also included. Published by Teton New Media in the USA and distributed by CRC Press outside of North America.